Good news, Chicago! The city has announced a plan to green its outdoor lighting fixtures. Beginning next year, the city will replace more than 270,000 park, street, and alley lights with new LED fixtures. The LED bulbs will last three times as long as the current bulbs and will save taxpayers money in the long run — since bulbs will not need to be replaced as often, and consume 50-75 percent less energy. Plus, they’ll provide brighter, cleaner light that will make walking the city streets at night feel safer. One aspect of this plan that we’re most excited about is the use of a smart lighting system, which will report on outages in real time, so that they can get fixed quickly and efficiently. 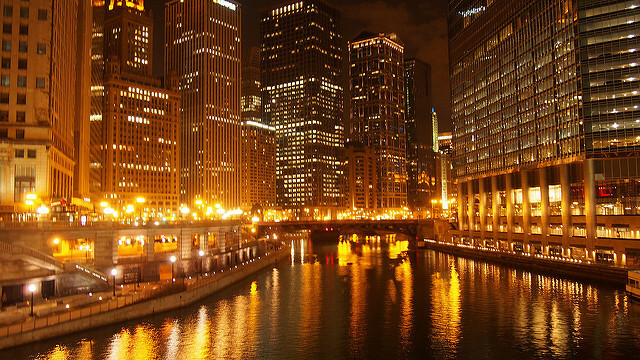 In that sense, the Chicago Smart Lighting Project is a lot like the Illinois Smart Grid, which also identifies power outages in real time. Get “green” bulbs: CFL and LED bulbs are both good options! Check out Citizen Utility Board’s CFL shopping guide for help finding the right CFL. They also have information on LEDs. Make the most of your daylight! Leave blinds open and use the sun’s rays to light your house during the day. Use “smart” power strips, which automatically stop draining power from the wall when your lamps are turned off. Connect timers, dimmers, or motion sensors to lamps to reduce the amount of energy you use. Are you already following some of these eco-friendly lighting tips at home? Tell us how they’re working for you in the comments section below.